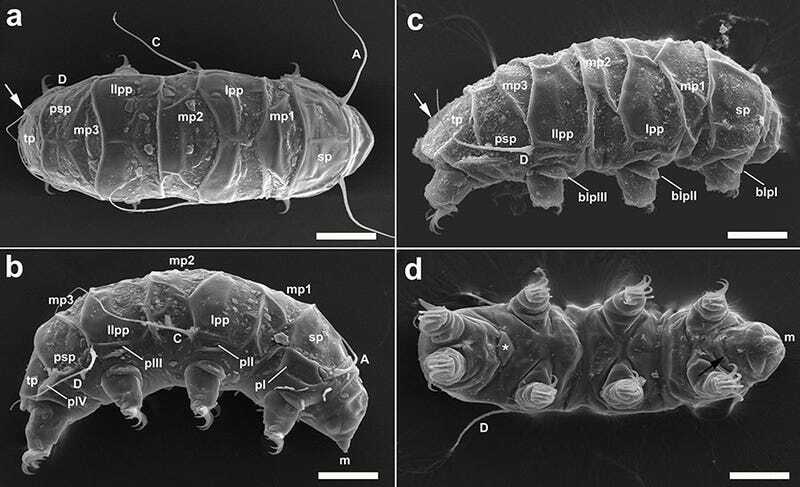 Introducing Mopsechiniscus franciscae, a new species of tardigrade — one of the hardiest creatures known to science. It's the first time this genus has been discovered as far south as Antarctica, a find that hints at this remarkable animal's ancient roots. Also known as moss piglets, tardigrades are microscopic animals typically found in moss and lichen where they eat plant cells or small invertebrates. These critters are found virtually everywhere — from the tops of mountains and hot deserts to the deep ocean. And they're ridiculously tough. These guys can deal with extremes of cold, heat, pressure, dehydration, poison, and radioactivity that would kill almost anything else. And in fact, tardigrades can even survive in the vacuum of space. And now we know they can survive the harsh conditions of Antarctica. The new species was discovered by Roberto Buidetti from Italy's University of Modena and Reggio Emilia while visiting Victoria Island. They were found on lake-shore mosses within the Crater Cirque, a natural bowl hollowed out by ancient glaciers. Analysis under an electron microscope revealed some distinguishing features, such as red-orange pads behind its claws, and a distinctive pattern of hairs on its body. Further DNA analysis proved that the scientists were dealing with a new species. This particularly Antarctica-dwelling tardigrade is likely descended from forebears that were present on the ancient supercontinent of Gondwana. They've changed relatively little since then compared to other tardigrades. Which makes perfect sense; why fix what ain't broke? Read the entire study at Polar Biology.